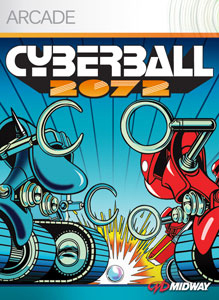 “Rediscover the arcade classic game Cyberball 2072 on Xbox Live Arcade. Take control of your robotic team, and call the plays to move your downfield for a touchdown. But watch out. The ball gets hot if you don’t keep moving. Keep your eye on the ball to make sure it doesn’t go critical before you can score. Call more than 100 plays for your robotic team.